Located in Pals, Baix Empordà, Girona, just 3km from the beaches of the Costa Brava and 68km from the border with France, is the seductive “Más Moscat” home. 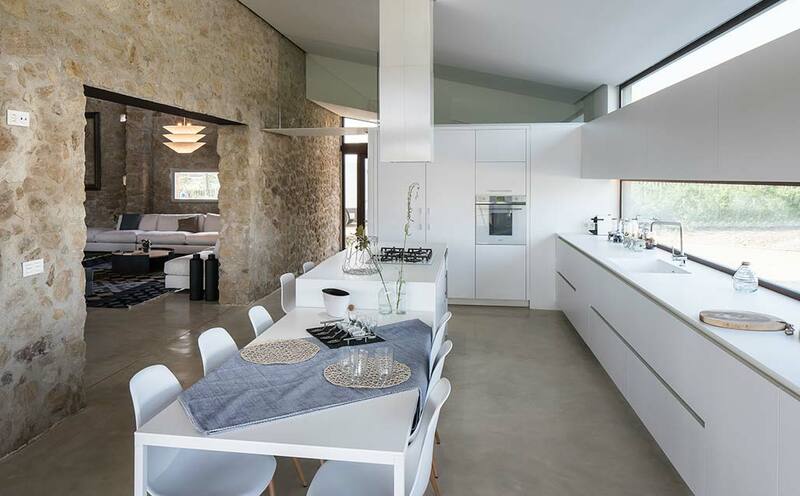 The renovation of this rural home has been carried out by the Gloria Duran architecture studio, which has used the Solid Surface from PORCELANOSA Group, KRION, in the kitchen and the bathrooms of the rooms. When the past and the future are carefully and respectfully harmonised, the results are usually a feast of sensations, and the “Más Moscat” home is a clear example of work carried out with respect. KRION, the new generation solid surface, provides increased modernity in the countertop, island and sinks of the kitchen. The customised countertop surfaces and integrated washbasins in the bathrooms of the bedrooms, are also designed with KRION 1100 Snow White by Gloria Duran. The work with KRION was carried out by the company Monthersan. This unique renovation was carried out by two partners who share the love for this region and its landscapes, Cases Singulars de L’Empordà, an idea born from the experience of a property developer and Gloria Duran Torrellas, who combine their knowledge to work on the purchase and renovation of old houses.